James Milner can think of at least two good reasons why Joey Barton’s description of Scottish football as “pathetic” is wide of the mark. 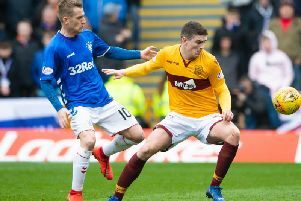 Fleetwood Town manager Barton – who was a conspicuous failure during his brief spell with Rangers in 2016 – compared the Premiership to Sunday League football but Liverpool midfielder Milner believes his comments are mistaken. James Milner shares a joke with Andy Robertson, left, during Liverpool training. Picture: Liverpool FC via Getty. Indeed, he doesn’t need to canvass opinion outside the Anfield dressing room to realise Barton is wrong. The world’s most expensive defender, Virgil van Dijk, has transformed Liverpool’s rearguard following his £75 million move from Southampton in January but his European education began during three seasons with Celtic. Similarly, Andy Robertson has solved the Anfield club’s problem left-back position since joining from Hull City but he first played senior football with Queen’s Park and Dundee United. The presence of Robertson and Van Dijk in Jurgen Klopp’s starting XI is enough for Milner to accept that the Caledonian game is not as dire as some make out. “Obviously not; I don’t know if Scottish football gets a bad rap because of the England-Scotland banter thing but we’re surrounded by people who tune into the Old Firm game,” said the former England player. “I don’t have experience of Scottish football but I’ve seen the players who’ve come down from Scotland over the years and know players who are playing in Scotland now. You can see how many good players there are and some of the things that are said are probably a bit disrespectful. The Premiership deserves respect because of the size of the two Glasgow clubs, if nothing else. You can see the buzz around them, the amount of people who want to watch the Old Firm game, the crowds they get, the atmosphere they create. Interest at Anfield has been heightened this season due to former Liverpool manager Brendan Rodgers at Celtic going head to head with former Reds captain Steven Gerrard. “We will definitely be keeping an eye on that one,” said Milner. “They are always good games to watch anyway but there’s a bit of added spice this time with the two managers going up against each other and their history. If nothing else, we have Andy Robertson in our dressing room, who goes on about Celtic non-stop. He will definitely have it on. l James Milner was speaking to publicise A Match for Cancer which will take place at Celtic Park on Saturday, 8 September. Tickets are now on sale priced £14 for adults and £6 for concessions.